… Well enough, in fact, that I went right on to read this sequel novella. Much shorter, but sweet enough to have been worthwhile. There would be no point in reading this without the original book first, though. Hmm … Nope, not ringing any bells. Can’t remember this one, either. Ah, this stays in the memory rather better. It’s a short-story collection, a “concept album” in which Hercule Poirot, before retiring, takes on twelve final cases, each of them loosely modelled on one of the twelve legendary labours of Hercules. I can’t call many of the individual cases to mind, but I do remember enjoying almost all of them at the time. I think this would make a pretty good first book for readers new to Agatha Christie. On paper, this sounds terrible: the story of a group of semi-anthropomorphised rabbits who leave their warren and journey to seek a new home because one of them is psychic and has foreseen the destruction of the old home. On the other hand, Buffy sounds terrible on paper, too: a teenage girl with super-strength fights vampires while trying to cope with high school. It just goes to show: ideas are cheap; it’s what you do with them that counts. And Watership Down is really, really good. It’s written well enough that you quickly overlook the flagrant unrealism of the rabbits talking. Their story is both harrowing and enchanting — and in places, genuinely moving. There is heroism, cowardice, wisdom and folly. There are also passages that are resonantly peaceful. And a quietly emotional ending. I’ve read this many times through the years, starting as a nine-year-old, though it’s been decades since the previous time I read it. I’ve often wondered: did it have to be rabbits? Would the same story work just as well if the group that left its home was a rag-tag band of humans in a dystopia, seeking freedom and safety in a dangerous world and avoiding totalitarian societies along the way? Overall, I think not. Watership Down is one of those perfect marriages of form and content, where everything works together to make something that transcends a merely exciting story. I couldn’t tell you why it has to be rabbits, beyond that Adams knew a lot about them and was able to write with authority about their lives, habits and habitats. But somehow they give the whole book the pastoral background that it needs. Apparently one of Christie’s two favourites among her own books (along with Ordeal by Innocence, which I’ve not got to yet. And it is indeed one of the ones that stays in the memory. The setting is the home of a complex three-generation family with all sorts of jealousies and other hostility bubbling under the surface. When the patriarch is murdered, there really do seem to be reasons why almost everyone could be under suspicion. The eventual solution is both deeply satisfying and profoundly shocking. One of her best. If I had to pick one adjective to describe this book, it would be “long”; and if I had to pick one adjective to describe my own state of mind when I finished it, it would be “relieved”. The Confusion is the second of three vast volumes that make up Stephenson’s “Baroque Cycle”, a sprawling historical novel that is broadly about the age of enlightenment, and is set in various parts of Britain and mainland Europe, with passages in Egypt, India, Manilla, Mexico and elsewhere. It has a cast of hundreds: even keeping track of who’s who is an undertaking. Each of the three volumes contains several “books”: eight in all. There are three in the first volume, Quicksilver, which I read some time ago; two in The Confusion; and three more in the final volume, The System of the World. To add to the confusion, the two books that make up The Confusion (“Bonanza” and “The Juncto”) are interleaved, each of them split into eight or ten chunks. They come together only at the very end, and only briefly. Dialogue between the lead characters of the two books consists of a single utterance: one of them doesn’t get to say anything to the other. The Confusion is a clever book; but not quite as clever as it thinks it is. The constant changes of scene and cast are too disorienting to be worth the value of the variety they bring. The discourse between the various natural philosophers (Newton and Leibnitz are both semi-major characters) is sometimes difficult to follow without necessarily being very illuminating. Eliza d’Arcachon, the lead character of “The Juncto” (though only present for about half of it) is cynical and manipulative, and though it’s clear Stephenson intends us to like her, I found it difficult to. Yet for all that, I do find myself sort of wanting to read the third and final volume. Despite myself, I do want to know what happens to these characters. I don’t imagine I’ll plough into The System of the World any time soon, but I think I will eventually. Would I recommend “The Baroque Cycle”? Not really. I think almost any other of Stephenson’s books would be a better introduction to his work. (The Diamond Age may be my favourite.) But there is something unique about it. I didn’t feel like it wasted my time. This entry was posted in Books, Reviews, What I've been reading lately. Bookmark the permalink. 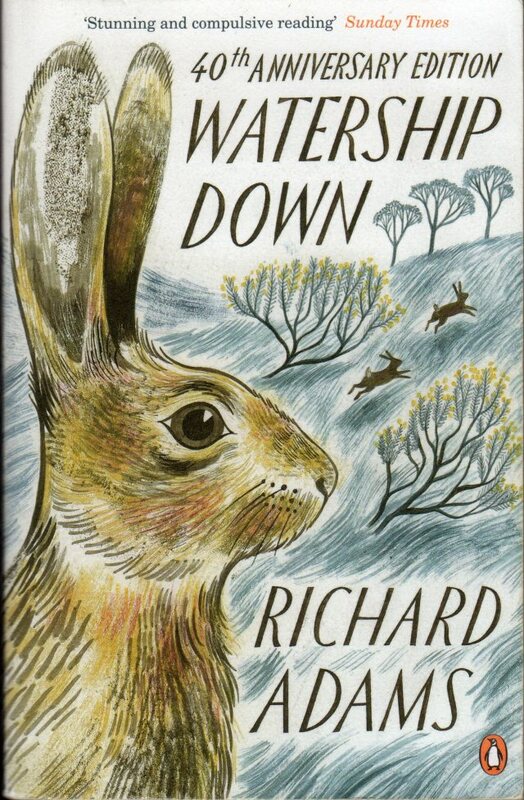 I only read “Watership down” because my children absolutely made me. What a lovely surprise. I enjoyed every chapter in fact I may read it again ! You’ll remember we first came across WD because Jean McSharry read it to us when we were in Year Five juniors. A very bold choice for a class that age, and one that paid off brilliantly. I love Watership Down too, read it many times as a child, and again recently. I dare anyone to keep a dry eye at the end. I remember I found another book by Richard Adams as a teen, The Girl in a Swing. I bought just because of the author, but it is rather a different book! It seems quite likely to me that Richard Adams was partly influenced by Tolkien, cf. his invention of a rabbit language and a rabbit mythology. And there are quite a few parallels between rabbits and hobbits. Conversely, if asking “did it have to be rabbits,” one could also ask, “did it have to be hobbits”—Bilbo et al. could have been human beings without otherwise changing the story that much. Among other things, I’d say that making the protagonists gentle creatures that normally stay close to their burrows (but are capable of unexpected fierceness in a pinch) heightens the emotional stakes of the “quest” narrative. @Kurt, what is Maia in this context? The Tolkien-universe angels? @Mike “Maia” is a book by Adams that (I believe) ties into the world of Shardik. Maia is a girl sold into slavery who rises to prominence in some empire, if I recall correctly. It was a long time ago when I read what I did.